Welcome to the Waterside Inn, a mecca for couples who appreciate fine French food and wine. A world-class restaurant with 13 hotel rooms, the Waterside Inn is located beside the Thames River in the tiny town of Bray outside of London. Founded back in the 16th century when Shakespeare was churning out new theatrical sensations, Bray is a classic Tudor town, its whitewashed buildings accented with black timbers. As small as it is, Bray is a gourmet mecca. Under the care and direction of world-renowned chef Michel Roux since 1972, the Waterside Inn consistently has been the recipient of three Michelin stars, the highest rating that can be achieved. Bray is home to a second three-star Michelin restaurant, The Fat Duck, which is also a Relais & Chateaux property. Check in at the Waterside Inn's front desk to begin your gourmet experience. Framed photographs depict the property's family and friends. Many of the world's most famous figures — from Elizabeth Taylor to Queen Elizabeth II — have made their way to the Waterside Inn since it opened in 1972. 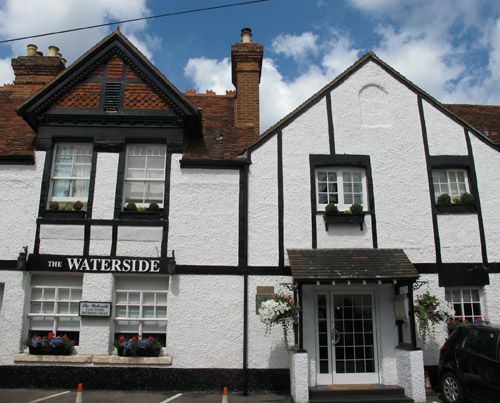 Meals at the Waterside Inn begin with an aperitif on the terrace overlooking the River Thames. Except for several weeks in January, the Waterside Inn is open year-round and serves lunch and dinner Wednesday through Sunday. In the summer months, Tuesday dinners are also available. Reservations, for both dining and overnight stays, are essential. Compliments of chef Alain Roux, this four-part amuse bouche provided a symphony of flavors and textures. The shot glass contained watermelon juice spiked with gin and diced celery, a perfect potable on a sunny day in June. Savoring this miniature four-piece culinary ensemble outdoors, shaded by an umbrella, the scent of roses surrounding us, our senses were aroused and palates piqued. The dining room at the Waterside Inn holds just 20 tables. Charm personified, the Inn's general manager Diego Masciaga orchestrates the room like a conductor. Presided over by internationally known chef Michel Roux and his talented son Alain, who has taken over daily kitchen duties, the restaurant is a destination for sophisticated diners. With a staff of 20 in the kitchen, exceedingly high standards, and only the finest and freshest ingredients used to prepare each dish, the price of a meal at the Waterside Inn is steep. Couples can choose between a prix-fixe menu and a costlier à la carte one. Gratuities and VAT are included in both. In addition to the fare, the restaurant’s romantic setting itself is extraordinary, positioned as it is with an unobstructed view of the River Thames. The perimeter offers outdoor space with tables and chairs shielded from the sun by umbrellas. We visited in June, when a profusion of climbing yellow roses in bloom added their fragrance to the air. But that’s just for starters. After you’ve made your selection from the menu, you are led inside the adjacent climate-controlled dining area, which also faces the water. The culinary embodiment of a summer afternoon on a plate. The menu changes quarterly, with the seasons. In addition to fish, diners can choose an entrée of beef, lamb, rabbit, veal, or duck from the menu, which is printed in both French and English. Vegetarian selections are also available. The cheese course is traditionally served after the entrée and before (or in place of) dessert. The pièce de résistance of our lunch at the Waterside was a raspberry soufflé, its crust as light, as sweet, as melting as cotton candy. Love to cook or intend to learn? Take home a Waterside Inn cookbook. Other signature gifts include wine stoppers, coffee, cognac, even kitchen implements. Each guest room at the Waterside Inn is unique in its layout and décor. From the two-bedroom suite that shares a balcony (ideal for couples traveling together) to the tiny Boathouse room, these quarters are made for romance. A simple but mouthwatering breakfast — fresh croissants, pain au chocolat, juice, and coffee — is delivered to the room. The true culinary experience begins with lunch and is repeated with menu variations at dinner. As a guest of the Inn, you are free to arrive for meals at your leisure; your table will be held for you. Overnight guests may also want to stop by the church of St. Michael’s, which dates to 1293. Both Windsor Castle, home to the Queen; and Eton, home to generations of English schoolboys; are five minutes from the Inn. Ascot is fifteen minutes away. Runnymede, where the Magna Carta was signed, is 20 minutes by car from the inn. The Waterside Inn features two private dining rooms that can be adapted for lunch or evening wedding receptions. While the Waterside Inn doesn't have the space to lodge 40 wedding guests overnight, it can accommodate the bride and groom and a few other couples. Since the town is so small, the rest of a wedding party could stay nearby. River Cottage features the intimate private dining room, separate living room, and walled courtyard. Weddings can legally be performed here. Oftentimes a local lady from nearby Windsor Castle comes to dine with her nearest and dearest. You may know her as Queen Elizabeth II. The cozy living room of River Cottage is furnished with antiques and paintings from Michel Roux’s personal collection that reflect a lifetime of good food, good friends, and good conversation fostered by these extraordinary surroundings. As is common in the travel industry, the writer was provided with a complimentary meal for the purpose of reviewing those services. While it has not influenced this review, About.com believes in full disclosure of all potential conflicts of interest. For more information, see our ethics policy .